Greetings of the Christmas season. You may have noticed that like last week, I am preparing my post earlier than the customary Friday. Last week, Christmas fell on a Friday, so I blogged on Thursday. Being that New Years’ Day falls on a Friday as well, I am posting today, Thursday, Dec. 31. As you may have heard or read from the copious news coverage, the Church has proclaimed two 20th-century pontiffs – Pope John Paul II and Pope Pius XII – eligible for beatification. 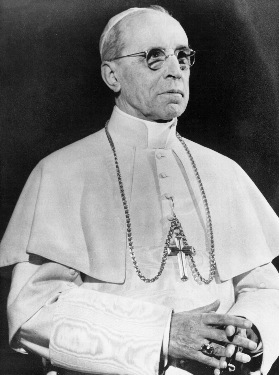 The recent announcement of Pope Pius XII being named Venerable was not without its controversy because of questions concerning Pius XII’s role during World War II. Obviously, as Catholics, we are very anxious to have good relations with the Jewish people and do not want to needlessly offend anyone. The role of Pius XII has been held up for criticism by many. However, I believe closer scrutiny will certainly demonstrate that Pius XII was not anti-Semitic, and indeed did very, very much to protect Jewish people during the war. I was in college when Rolf Hochhuth’s play, “The Deputy”, came to Broadway. It was a great media success. The story line is very compelling. It’s the story of a young priest working in the diplomatic corps of the Vatican in Germany who goes to Pius XII to tell him about the concentration camps and the extermination of the Jewish people. The Holy Father was portrayed as inept and backless, and one who did nothing about it. The priest goes back to Germany, pins a Star of David on his cassock, and marches into the extermination camps. It’s a very powerful play, but one that has unleashed a lot of calumnies about Pius XII and his role. At a time when the United States and Britain were turning Jewish refugees away, the Vatican was hiding refugees in Castel Gandolfo, in Vatican City and in convents and monasteries throughout Italy. I feel the more facts are known, the more people are going to be comfortable with the Holy Father’s decision to advance the cause of canonization of Pius XII. I was encouraged by a Dec. 28 article published in the New York Post in which Pius XII’s record was explained. It was written by Gary Krupp, a member of the Jewish community from Queens who has extensively studied the Pope’s role during World War II. Upon investigation he shockingly found Pope Pius XII to be a friend to the Jews and very critical of the Nazi regime. – In 1917, at the request of World Zionist Organization Director Nachum Sokolow, Nuncio Pacelli (who later became Pius XII) intervened with the Germans to protect the Jews of Palestine from extermination by the Ottoman Turks. – In 1925, Pacelli arranged for Sokolow to meet with Pope Benedict XV to discuss a Jewish homeland in Palestine. – In 1930, Pacelli supported the German bishops’ orders excommunicating anyone who joined "the Hitler Party." – In 1938, Pacelli intervened to defeat a Polish anti-koshering law. – In 1939, A.W. Klieforth, the US consul general based in Cologne, Germany, wrote a confidential letter to Washington reporting on the "extremeness" of Pacelli’s hatred of National Socialism and of Hitler. – In 1947, at the United Nations, he encouraged the 17 Catholic countries out of the 33 in favor to vote for the partitioning of Palestine to create the State of Israel. – A 1948 deposition by Gen. Karl Wolff, the SS commandant for Italy, revealed the Nazis’ wartime plan to kidnap the pope, kill countless cardinals and seize the Vatican. Decisions that Pius XII made as far as denunciations, whether to do it publicly or behind the scenes, are things that people might criticize, but I think his intentions and the concrete help that he provided to rescue so many Jews (Some people would say that no one was responsible for rescuing as many Jews as Pius XII during the Second World War.) needs to be taken into account when making a judgment on this man’s character. So, I hope that the investigations will continue and that the Holy See will cooperate as much as possible. I think it is to the advantage of the Church for people to know the whole story about Pius XII. But, I feel confident it will be a very different image from the one projected by Hochhuth and his KGB cabal, which posed that play in order to smear Pius XII and the Catholic Church. Now, I would like to share with you how I spent my Christmas. 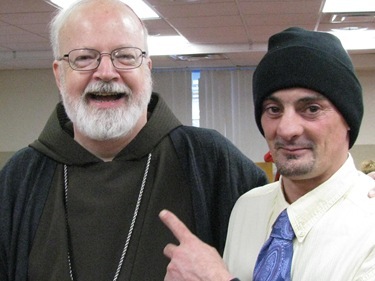 On Christmas Eve, during the day, I went to Pondville Correctional Center and celebrated Mass for the prisoners with Deacon Jim Greer, who oversees our hospital and prison chaplaincies. Pondville’s chaplain, Mary Beth Robinson, was there and was very welcoming during my visit. Prison superintendent Michael Thompson was also very hospitable. 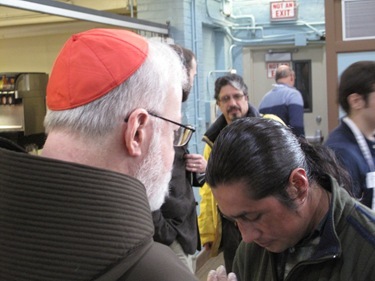 Following the Mass, we had a reception with the prisoners. Prisoners here are near the end of their sentences, and were sent to this prison to get ready for their after-prison life. The prison reflects the low security, and some of the prisoners are on work release. A number of the prisoners are involved in a program to train seeing-eye dogs, and to help people with disabilities. It was very moving to see how the prisoners take care of these puppies (They were mostly retrievers and black labs – very people-oriented dogs.) and to listen to the prisoners say how happy they were to train these dogs, knowing that the dogs were then going to be able to make such a difference in people’s lives. In fact, they even brought these dogs to Mass. It was a very beautiful liturgy. Certainly, at Christmas time, people who are separated from their families and in those situations like in prisons and in hospitals, suffer a lot. 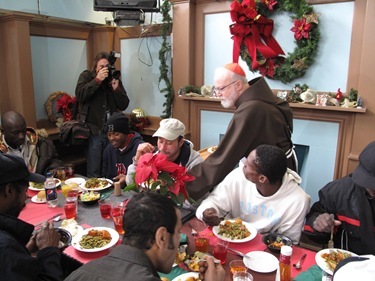 In our faith, the meaning of Christmas and Jesus’ own deprivation at Christmas are signs of hope and consolation in people’s lives. 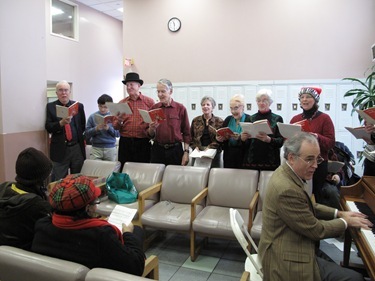 It was good to see the volunteers there who provided the beautiful music and sang Christmas carols. Mary Beth decorated the chapel very beautifully. 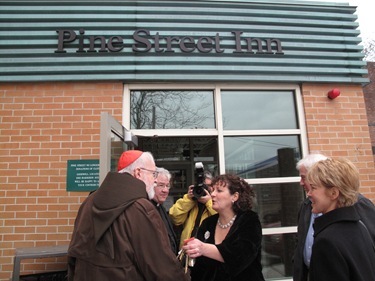 Later that day, I went to Pine Street Inn to visit the homeless and serve them Christmas dinner. This is the 25th anniversary of Pine Street. 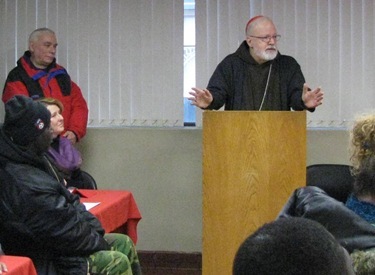 I was accompanied by Lisa Alberghini, the director of our Planning Office for Urban Affairs, and Msgr. 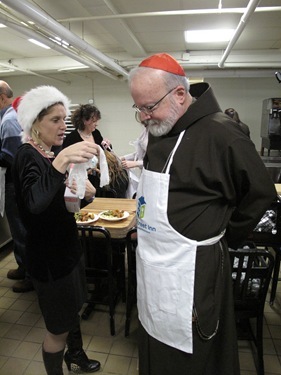 Frank Kelley, Pastor at Sacred Heart in Roslindale, who was one of the founders of Pine Street Inn. Also there was Sister Kathy Green who is doing a very impressive job in the women’s unit. We were able to meet many of the volunteers. 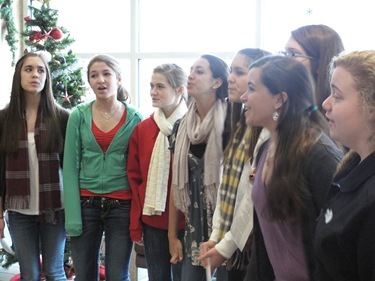 There was a group of girls from Weston who sang at the beginning, and another group that provided Christmas carols. There were quite a number of volunteers. 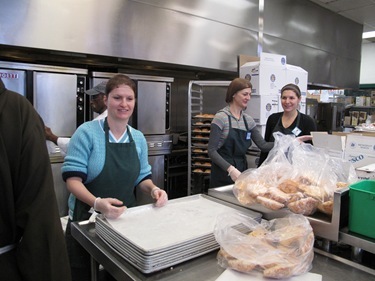 In one family, there was three generations – grandparents, parents, and children – all helping to serve the meals and to be with the homeless people. Lyndia Downie, president and executive director of the inn, and her staff are doing a great job performing this vital corporal work of mercy. At midnight, I celebrated Mass at the Cathedral. 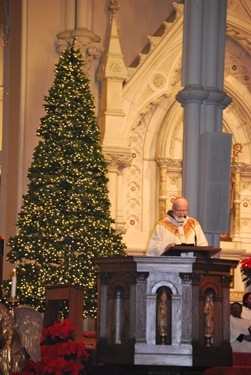 There was a concert of musica sacra and Christmas Carols before the Mass began. We began with the Christmas proclamation. It was very well-attended. The Cathedral looked very beautiful. So many people helped to decorate it and put up the crèche. 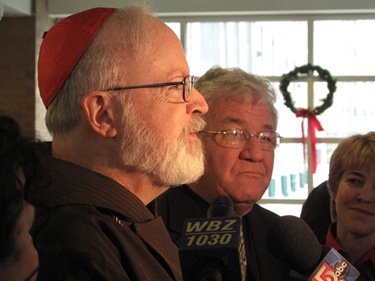 The next morning, I had the TV Mass with the Daughters of St. Paul, which aired on Channel 7, WHDH, as well as its affiliate WLVI. 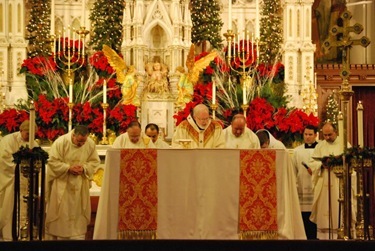 This year we had a full hour for the Mass. It was a good opportunity to reach shut-ins and a lot of other people throughout New England who were able to receive the Mass. The sisters always provide the singing. 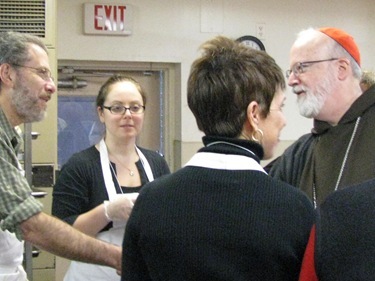 CatholicTV’s General Manager Jay Fadden and his family were there participating at the Mass. After that, I went to St. Francis House where I had a Christmas service of the Word. 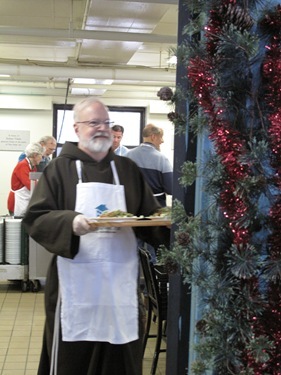 Then, we sang Christmas carols and blessed the food. 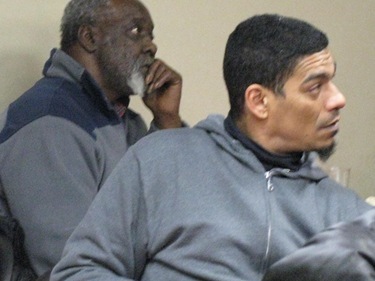 Once again, St. Francis and Pine Street are finding their resources are very, very taxed as the number of homeless people, and even those who are working but have no homes, are depending upon their services. 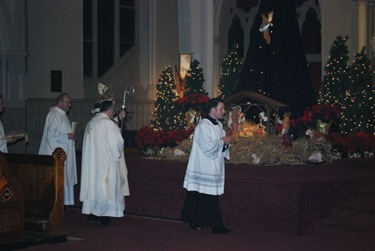 On Christmas night, I went to visit my family, and upon my return I was pleased to find a message from the Holy Father congratulating me on the occasion of my feast day. My religious name, Seán, is the Gaelic form of John, in reference to St. John the Evangelist, whose feast day was Sunday, Dec. 27. When I was a young religious novice, we celebrated our feast days in a very special way. 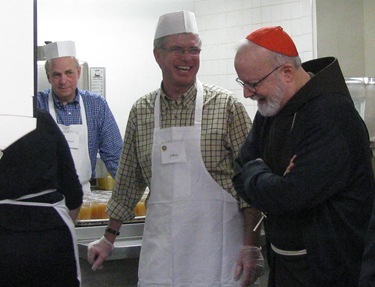 The day before, we would kneel in the center of the refectory and the friars would serve the table but bring you food as you knelt there. But then, on your feast day, there was always a special desert. On the feast of St. John, we had the custom of blessing the wine because the legend was that St. John was poisoned. They put poison in his cup and when he blessed it, a snake came out. On the occasion on the Feast of St. John, I happily convey to you my cordial greetings and an assurance of my prayer that the Lord may sustain you with his strength and fulfill you with his peace. As a pledge of divine grace in the Lord Jesus, I willingly impart my apostolic blessing. I was very touched and honored that the Holy Father remembered. I pray through the intercession of St. John that I will be able to be of some assistance to our Holy Father.